Litter is a social problem that affects us all. Litter on the roads and highways are a direct result of individual actions. Cigarette butts are the number one most frequently littered item. Did you know that litter near storm drains, especially plastics can contaminate waterways? Storm drains lead to waterways, so litter poses a potential hazard to marine life and our nation's water system. Results from the nation's largest litter study as posted by Keep America Beautiful states that over 51 billion pieces of litter appear on U.S. roadways each year. 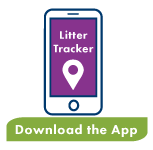 Packaging litter makes up nearly 46% of litter 4 inches and greater. This includes but is not limited to fast food containers, snack wrappers, plastic bags and other packing products. Besides the negative environmental impact, littering also has a direct effect on your bank account. Litter on the streets causes property values to decrease and property taxes to increase. Did you know that litter also causes car insurance rates to increase?